Will stats for AskMe be available on the profile page? Are we adding stats for AskMe to a user's info page? That is how I mostly keep track of threads in which I am usually only marginally involved. If this has been covered before I openly apologize. 36 hours ago, I posted a message in Ask Mefi regarding what it would take for the world to adopt a more secure method of email to prevent nefarious people from spoofing legitimate email accounts. This morning, my inbox was flooded with hundreds of bounced spam emails from AOL, apparently unrelated to the MyDoom virus. What I want to know is, who's the wiseguy? Hey kids. The NYC meetup previously bruited about is a go for 20 February, at Veselka, at 19.30 hours p.m. of the evening. Get yer borscht on. Why no commentary nor pictures of the MeFi Portland meetup? Here it is, Monday, and not a word about it. Did it happen? Did #1 make it? Did any of you? Details on the Amsterdam meetup. Details on the coming Amsterdam MeFi gathering are here. Drop me a line if you'd like to join. As ineffective as the injunction against Iraq-related threads on the posting page was, maybe something similar might be a good idea to head off what is certain to grow into an onslaught of suboptimal posts like this one over the coming months. I've noticed a trend of increasingly common political commentary in front page posts. Most recently, some of the links have been to news stories specifically for the purpose of criticizing them. Should we adopt an explicit policy of links on the outside, commentary on the inside? Any plans for MeFi skins/theme support? The skins are designed by the users, for example at LinkFilter. Are we infected with paid spokespeople/meme spreaders/spinners? He raises an very interesting question. Are we infected with paid spokespeople/meme spreaders/spinners? Anybody who is going to the Metafilter Meetup in Portland, OR as discussed in this thread tomorrow at 6pm, please post inside. Did everyone read stav's phenomenal post on his blog? Tom Coates called it, "the 2004 State of the Weblog Nation." Anyone else getting their new link/comment counter reset to zero on the first (main page) reload? Anyone else getting their new link/comment counter reset to zero on the first (main page) reload? Since yesterday or so, any time I click through to a thread and then go back to the front, every thread is reporting all comments as read. Seems to be happening on the grey and green too. Anyone interested in a MeFi gathering in the Netherlands ? It seems that there are at least two dozen Dutchies around. Dus laat wat van je horen, zou ik zeggen! The Portland Meetup this Friday (1/23) at 6pm will be held where? the blue, gray and green all seem remarkable slow the last two days. pages seem to load in fits and starts. often the page appears to be waiting for google ads, but sometimes not. what's the deal? A great, interesting, informative 'interview' with Our Fearless Leader. Can we please keep politics off AskMetaFilter? [MI] needs to die PDQ IMHO. AskMe threads are disappearing off the front page at high speed as floods of new questions come in. It seems to me that a good many questions could have been answered had the question-asker put a bit more effort into googling. What are we to do? Very Small Pony: Matt, would it be possible to copy the code used for the URL search on the Post A Link page onto the Search page, so it could be accessed even if you have posted something within the past 24 hours? I appreciate that this has been raised before, but wouldn't it be good etiquette for questions on AskMetaFilter to at least contain a question? Surely two words is not enough? Pardon me for asking, but WTF? I can't think of how this answer is useful, or even humorous yet off topic. It's just random and potentially offensive in a surreal sort of way. How do we head this stuff off at the pass? The "as useful as you make it" bit isn't working. 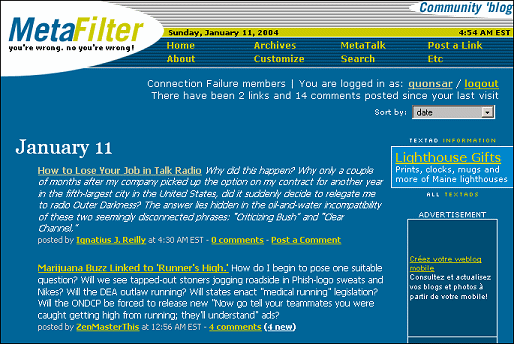 Anyone really know the history of MetaFilter? Fact: This is an awful post. What if everyone ponied up, say, five bucks to a PayPal account? That's $70K. We make that our max bid, and if we lose, we either get it back or make a donation to a music charity. So how do we bell this cat, and how many brave mice want to participate? is it possible to ask Windows-related questions on AskMe without being sneered at? Do you think it might be possible to ask Windows-related questions on AskMe without being sneered at? What about a quick way to mark best answers or solutions in askme? Would it be possible to get plaintext versions of MeTa and AskMe, which could be tied to our selection of same for MeFi in our profiles? Is there an AskMe rss feed? Are self links okay in AskMe? Are self links okay in AskMe? This question appears to appropriate AskMe for a commercial purpose. In response to the answers I got in the Axme Thread here, who here lives in Portland, OR and wants to meetup to talk about homebrewing? What's the appropriate response when someone loses their cool for no apparent reason? You guessed it, Postroad loses his grip in a post about a pink tank. I know the dude's got a history of derailing, trolling etc, which this community moderately tolerates. But this was a post about painting a tank freakin' pink. When is it time to say STFU? The L.A. MeetUp (unpopularly known as MeFiSoCalWenCom04) is coming: Not this weekend, but next weekend. I'm requesting "pre-registrations" so I can put together "swag bags" for those who attend. Still taking location suggestions. More details at MEAT.METALIFTER.COM Mis-spell it carefully. On our inividual profile pages, it says how many times we've posted to MetaFilter and MetaTalk, but it doesn't yet mention AskMeta. That way we know who the real helpful folks are. sidebar link broken; what was it? From the front page side bar. Is the link broken or down? Why make an ASSUMPTION about someone's intent? It used to be frowned upon to post links from other link agregators/filters. Has it changed? A link to an AP correction is not a good post. A link to an AP correction is not a good post. A kill is mandatory. With the utmost respect, blow me. WTF?!?!? With the utmost respect, blow me. WTF, FFF? The Worst. Macworld Keynote. Ever. I just want to congratulate AppleFilter collectively on refraining from any lame, gratuitous FPP's about the Worst. Macworld Keynote. Ever. Ask MeFi's finest hour. Enough to bring tears to my eyes. How do pidgeons mediate when they're on the loose? I can't post a comment to Ask MetaFilter. When I hit preview it shows nothing under Comment Preview. I'm using Mozilla 1.3.1. Is it illegal to post information here that would enable someone else to do something illegal? Matt doesn't want it but it seems a bit harmless to me. Is it illegal to post information here that would enable someone else to do something illegal? Bearing in mind that any possible crime in this case would take place in Portugal. What could happen to Matt+MeFi if we put up enabling information here? Any lawyers? Ask the damn question on the front page, already! A few recent examples of a growing Ask MetaFilter trend that's starting to annoy me. I'd move for a few guidelines: 1. Ask a question on the front page. 2. Make some effort in striking a balance between salience and brevity on the front page. If you include a character entity in text for preview then it is displayed correctly and appears (as the appropriate character) in the edit area. However, when you click post, the character is converted to "?" (ie. posting character entities is OK, but if they're previewed then they're converted to the equivalent extended character, which is not accepted by "post"). I'm a big fan of Safari. Any chance of Matt, or any other programmers here, creating a MeFi sidebar for this browser?